Our topic for today: Vow art that wows. Immortalize your love by creating a vow art piece you’ll cherish forever! Without a doubt, your wedding day is one of the most unforgettable days of your life. Making a special promise to someone to let them know that you want to be bound to them for the rest of your life is a big occassion. What better way to remember this promise than by creating and displaying your very own wedding vow art. It wasn’t always that way. Marriage customs of the past didn’t place as much importance on wedding vows. Things have changed, and modern wedding ceremonies place a great importance on vows. My advice is to take the necessary time to create special vows. Don’t wait until the last minute. That way, you can turn them into a piece of artwork that you’ll be proud to showcase in your home or workspace. Wedding vow art can be used as part of the ceremony itself, as a display, piece of attire, or as a keepsake. Here are some unique ideas we researched to turn your wedding vows into works of art. If you are into Japanese art, the above image needs no introduction – a hand-folded origami parrot. Made up of your wedding vows and printed on iridescent white paper, this unique papercraft piece of art is an absolutely precious idea! It comes with a handmade wood base to display the bird as well as a glass bell to keep the parrot tucked safely away. What a perfect way to display a photo from the big day. Make it even more meaningful by surrounding it with a matte that displays your vows. After the wedding, this framed photo will remind you of your special promise to each other. From gold foil, letterpress or print, turn a special poem from your wedding or your vows into a stylish and personal piece of art. 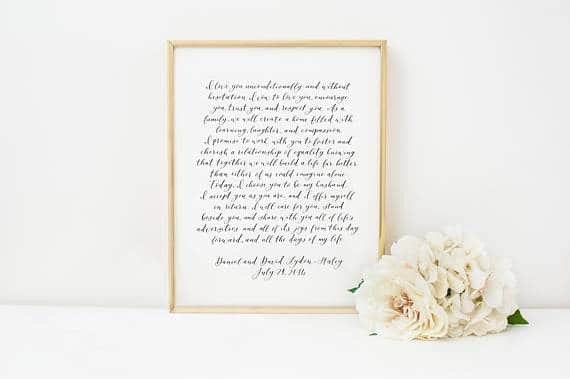 Another option is to have your vows handwritten and framed on their own, which you can then use during the wedding ceremony and read from your framed vows aloud. 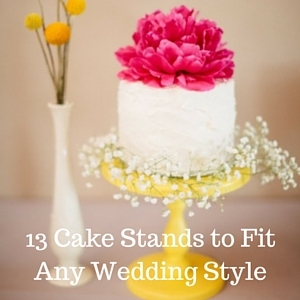 Display them afterwards at the wedding reception. Instead of walking down a traditional red carpet, why not use a unique vow aisle runner instead? Write your vows along the aisle runner for a dramatic entrance. After the ceremony, you can use your customized aisle runner as a stunning backdrop for wedding photos. Want a unique gift to give your significant other after the wedding ceremony? 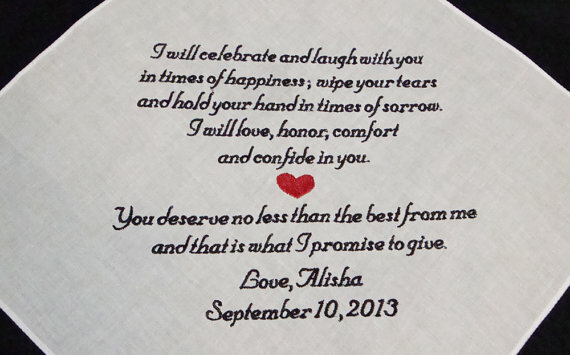 A custom embroidered handkerchief complete with the promises you made to them on your wedding day. Later, frame and display the handkerchief as a keepsake. Having your vows professional written in calligraphy is a special way to display such meaningful words. Add them to a shadow box (like the one below) with other bits and bobs from the wedding to create a very beautiful display. Many couples dry and preserve their wedding bouquet or groom’s boutonniere as a keepsake. You can place the flower arrangements into a frame together with your wedding invitation and vows. An all-in-one keepsake idea! If you or your spouse enjoy writing or keeping a journal, then a wedding vow notebook is a good gift idea. Purchase a couple of leather journals embossed with your wedding vows on the cover. Great typography never goes out of style. 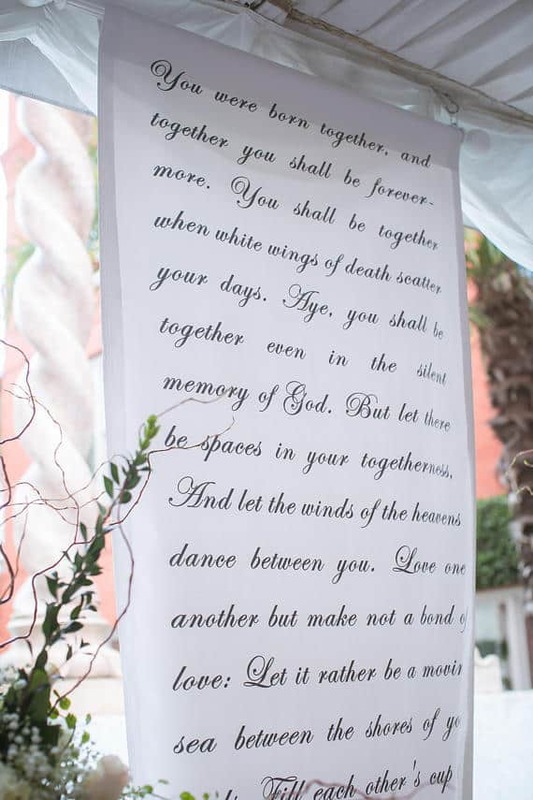 Create a poster using your wedding vows to make a fantastic display during both your wedding and reception. Afterwards, you can hang it in your bedroom as a unique keepsake. Sometimes small is better. Create something like this small vintage-inspired type with your wedding vow as a beautiful keepsake beside your night stand. Something for just you to appreciate and admire every night before drifting off to sleep. We love unique guestbook ideas like the one above (check out more cool guestbook ideas here). A poster that features your wedding vows can also double as your wedding guest book. A time capsule is a great way to look back on a special occasion. Consider making a wedding vow time capsule that will be opened at a future date. Right after your wedding, place your wedding vows in a time capsule together with other items. You can add your invitation, photos, letters, and other keepsakes. After making the capsule, decide on a future date to open it. 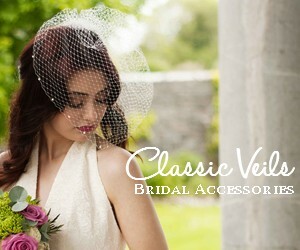 This can be on your tenth wedding anniversary or on another special day. Its always fun to look back at photos and other objects from such a special day. A set of two pens that displays your personalized wedding vows is certainly unique and funcationsl. Use the pens on your big day to sign documents during the ceremony, or for signing your guestbook. Warning: this ones not for everyone. In fact, I’m not too sure if I would go out in public with it hanging around my neck. But hey, to each her own. Perhaps you identify with this idea, that’s why its on this list!! 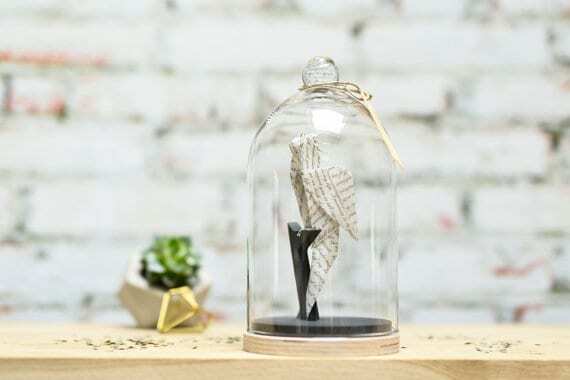 A unique way to display your wedding vows: type them out on a small scroll and insert into a tiny glass terrarium pendant. 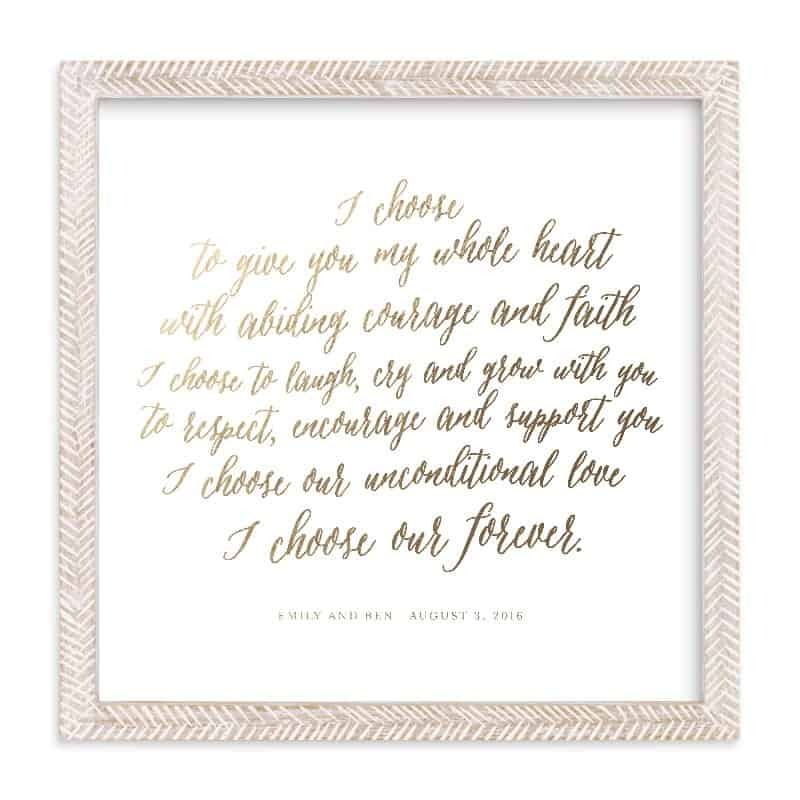 Add a personal touch over your bed with vinyl wall art that features your wedding vows. You’ll be sure to have an “aww” moment every time you see it. Have your vows engraved on a metal wallet card so that you will always carry them close by. Everyone loves a good throw pillow. Or is it, ‘everyone loves a good pillow to throw’? I can never remember. Either way, printing your vows on a pillow is definitely a unique idea! Not the type of couple who likes to splash personal vows around your house? Neither am I. That’s why I actually really like this idea. It’s well done as a piece of art and conversation piece in a room. Take a recording of your wedding day and turn it into a unique piece of art by capturing your wedding vows as a visual sound wave. Again, if you’re into displaying your vows through jewelry, a matching necklace and earring set for could make a beautiful present. Neat idea. Take your vows and make them into cuff links and/or a tie pin that the groom can wear on the big day. If you are wanting to incorporate a hand fasting ceremony during the wedding, rather than rope, look into this personalize embroidered tape that can display both of your vows. Time waits for no man … or wedding vow. Wedding vows are a personal expression of a commitment to one another and you should be able to see them every day. You can do just that by having your own wedding vows clock. You likely put a lot of time and effort into writing your wedding vows. Don’t let them be forgotten. Take the time to preserve them and make them beautiful! Wedding vow art turns your promises into something that you can see over and over again. You and your spouse will be forever reminded about the promise you made to one another.